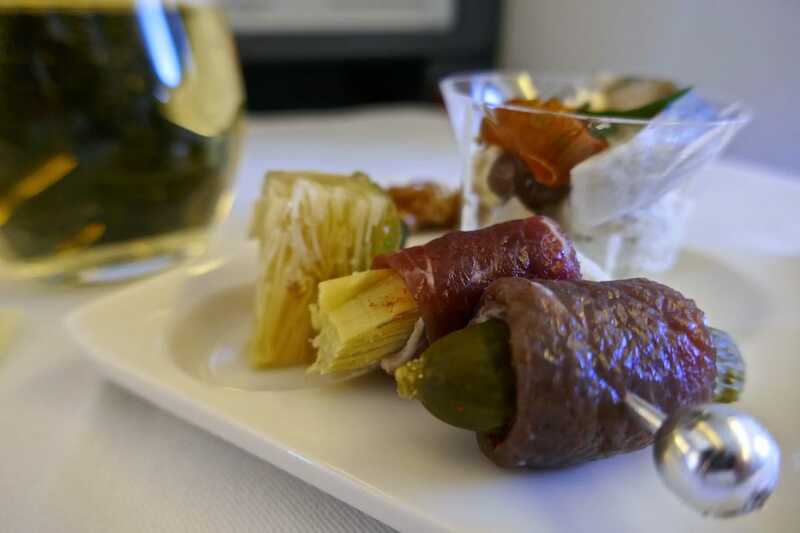 The very sweet Japanese cabin crew girl onboard our ANA business class flight from Tokyo to London giggled at this proud Frenchman as he pouted fiercely, preparing to tuck into his beef steak fillet and Aomori black garlic confit. 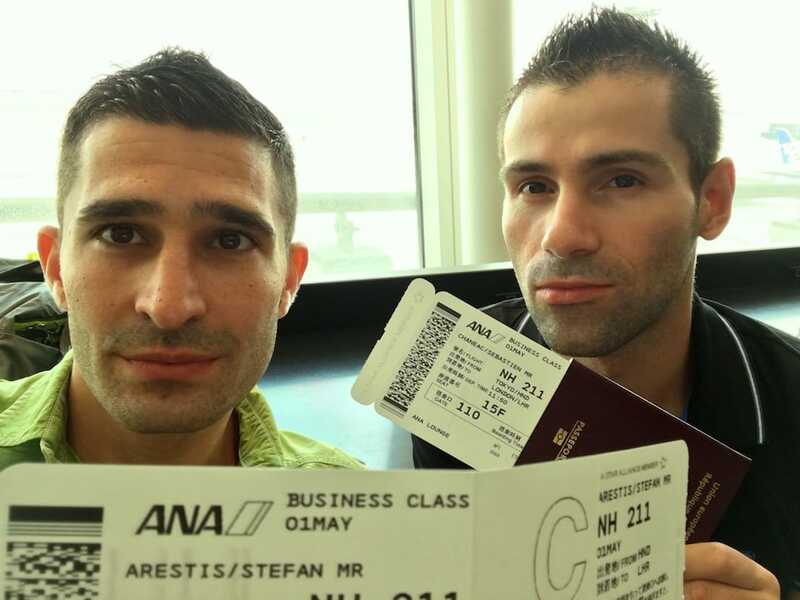 Stefan also looked on in a fit of giggles as Sebastien so effortlessly settled into his ANA business class experience. And wouldn't you? All Nippon Airways (ANA), Japan’s largest airline, is not only recognised as one of the seven 5-star Airlines by Skytrax, its business class was rated as the fourth best in the world at the 2015 World Airline Awards. The accolades don't stop there: in the same year, ANA's business class was also highly rated for its seats, airline staff, catering and comfort amenities. 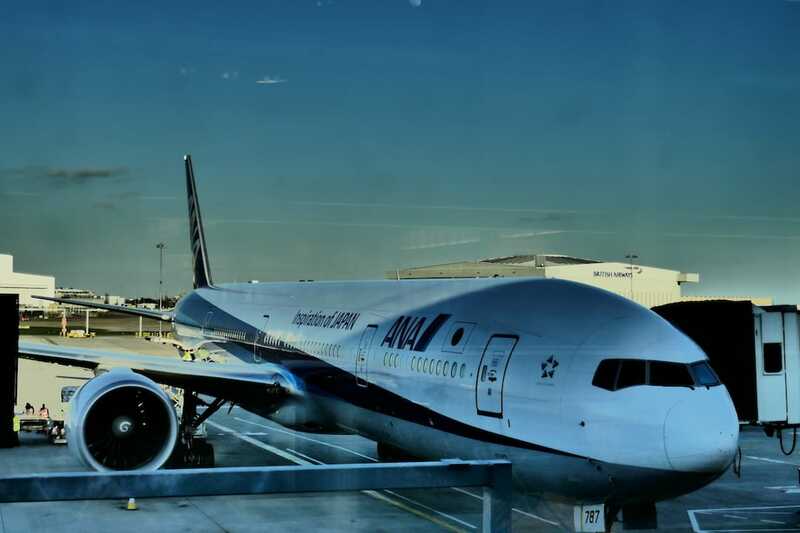 We flew business class on ANA Boeing 777-300 on our way back to London from Tokyo (12.5 hours) thanks to a very good deal we found on Skyscanner. 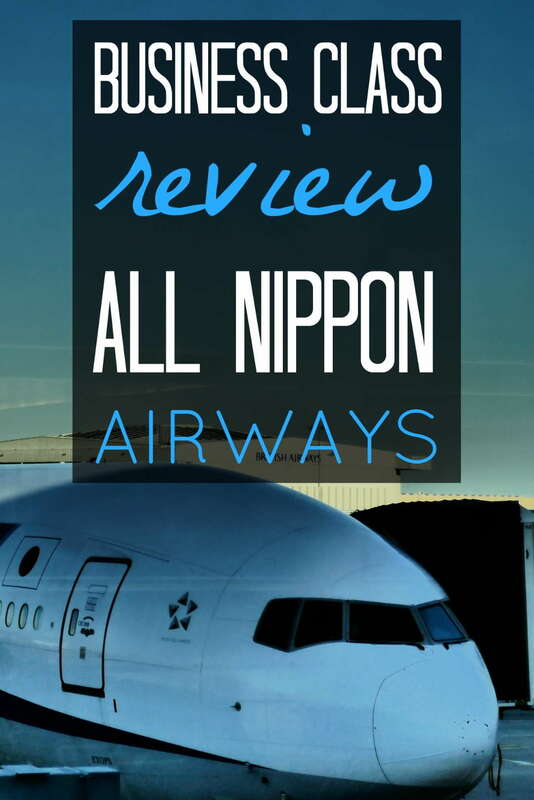 We loved every second of it, and could not wait to write our review of flying business class with All Nippon Airways. SO IS IT WORTH FLYING BUSINESS CLASS WITH ANA? Business class check-in with ANA is very smooth and efficient. The airline has its own dedicated desk for business class passengers at Tokyo Haneda airport. Once through security and immigration, a spacious lounge overlooking the runway awaits you. There, you can get some refreshments, food and also use the showers if you need to. Plane addicts (like our champagne hogging Frenchman) will have heaps of #planeporn fun here. 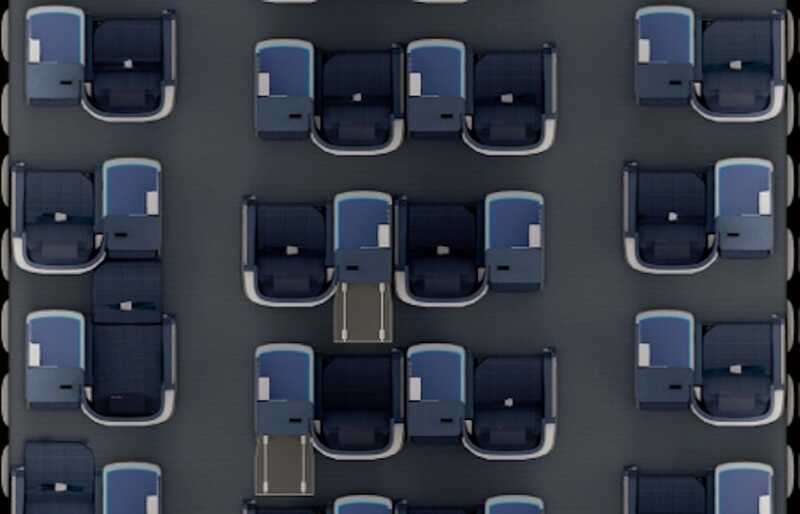 The ANA business class seating arrangement has been carefully designed using a staggered 1-2-1 configuration, ensuring a sense of privacy for each passenger as you're never directly next to anyone. This also means that every passenger has direct aisle access, avoiding the unpopular middle seat dilemma. The real fun starts from the moment you board the plane and take your seat. These are no ordinary seats. 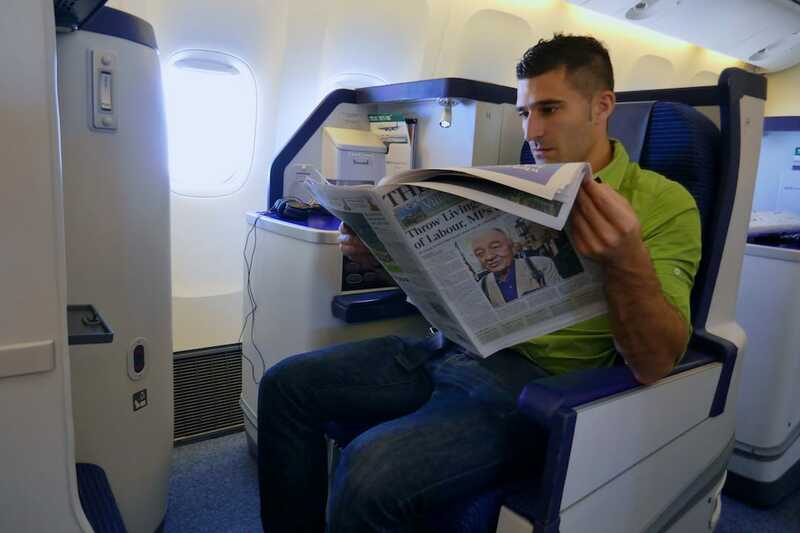 ANA's business class seats were rated the 5th best in the world at the World Airline Awards and deservedly so. The seating area is very spacious with a fully reclinable seat, large side table and your own personal over head luggage drawer. The seats have a width of 19.4 inches/ 49.3cm and fully recline to a length of 74.5 inches / 189cm, to become a very comfortable flat bed. For us this was more then enough space to sleep in a straight position (Stefan is 170 cm and Sebastien is 175cm). A bed pad and a soft warm duvet are provided which makes for a very comfortable night's sleep. The standard of service on board ANA is extremely high, as you would expect from a Japanese airline. They were rated one of the world's best cabin staff at the recent World Airline Awards and considered the #1 for best airline staff in Asia. The staff are never short of smiles. And of course neither were we when greeted so warmly (with a glass of champagne to hand). The ANA staff take a genuine interest in you without being intrusive. They make you feel like you have your own personal attendant throughout the flight. They are on hand whether you want to order a particular meal, want a copy of The Times newspaper, or just want to top up your champagne. Throughout the duration of the flight they ask you if you want more drinks and always ensure you have plenty of water to keep you hydrated – and always with a smile. The meal service is high class. 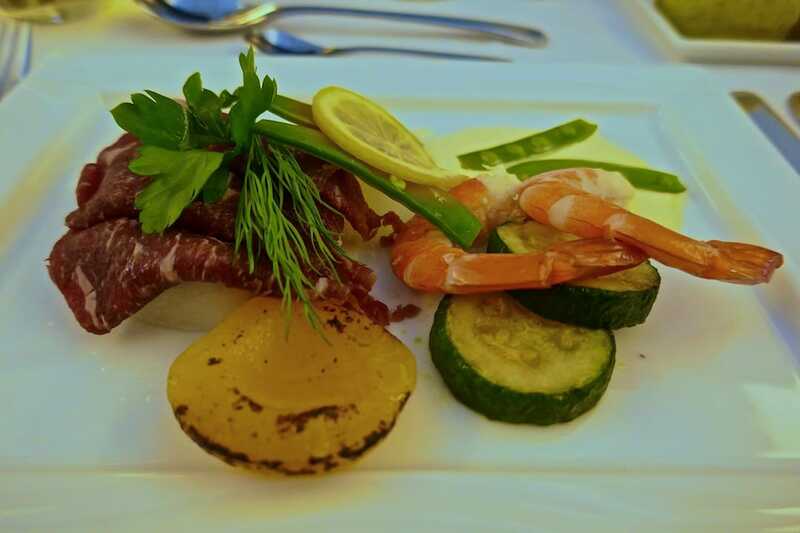 Menus have been selected by THE CONNOISSEURS, a group of master chefs and wine experts from outside and inside Japan. 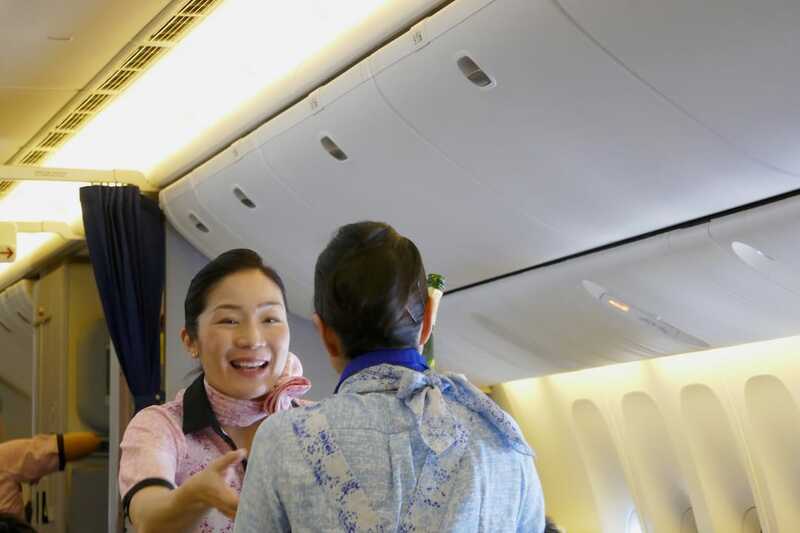 The friendly cabin crew lay a white table cloth, provide you with a warm towel and present all passengers with a menu, listing the excellent culinary options. For the first meal, you have a choice of the Washoku Japanese Cuisine or the International Cuisine. If you choose the Japanese cuisine, you'll be spoilt with a variety of culinary prizes like firefly squid with vegetables, chilled quick-poached beef with ponzu jelly, quick-seared seven band grouper, quick-poached diamond squid with nori and simmered mackerel in soy based rice. This option included smoked shrimp, soft-dried beef and marinated turnip starter with a main of fillet of beef steak, Aomori black garlic confit with teriyaki sauce and sautéed tilefish and cereal risotto with slaty cherry blossom-flavoured sauce. Everything is so beautifully presented, making it hard to put the camera down and tuck in. There's everything you could possibly imagine on offer, whether it's whisky, sake, wine or beer. They have a great choice of white and red wines which have been carefully selected to compliment their menu. The champagne Henriot Brut Souverain on offer was enough to satisfy even this demanding Frenchman's taste buds. 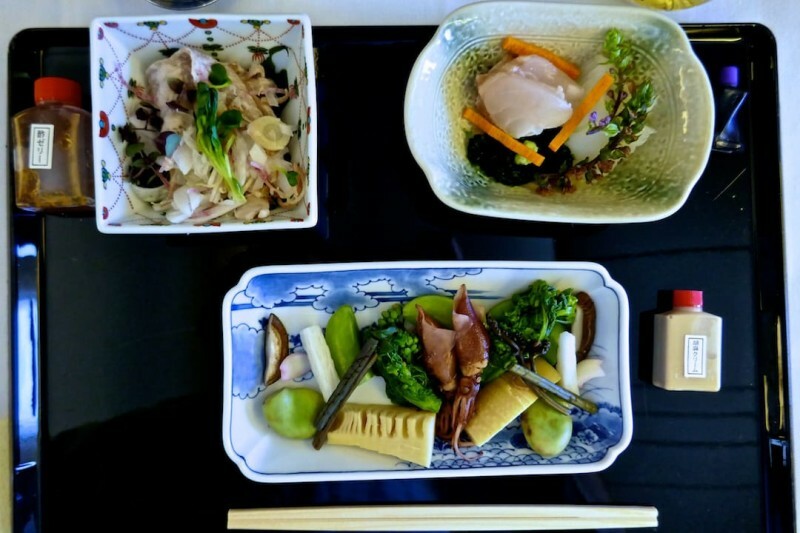 For the remainder of the flight, a selection of Light Dishes are available for order at any time, like salads, soups, croque-monsieur and also including some of our Japanese favourites like udon noodles, ramen and okonomiyaki (Japanese pancake). Each cubicle has its own large 17 inches touch screen with the ANA Sky channel entertainment system, which includes some of the latest blockbusters, games, music and documentaries. Sony noise cancelling headphones are provided, which are so effective, they make you forget you're flying. 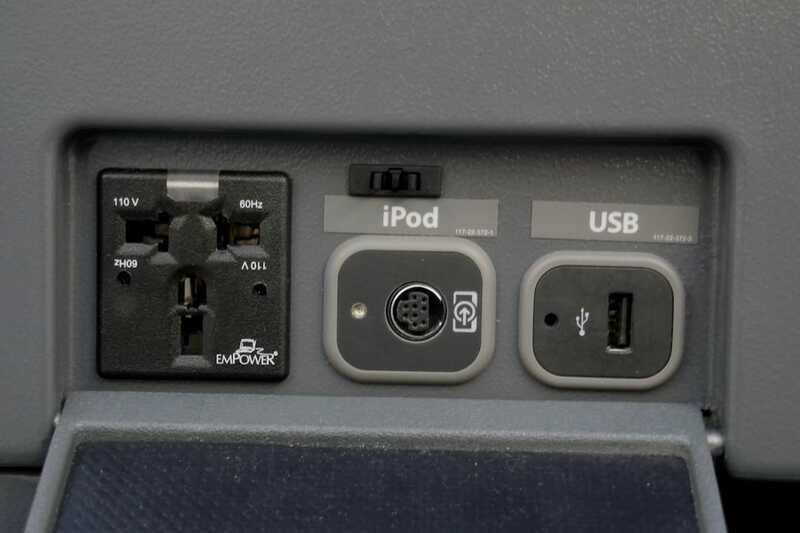 Underneath each screen is your own personal USB dock and power connectors to charge your phone and laptop. 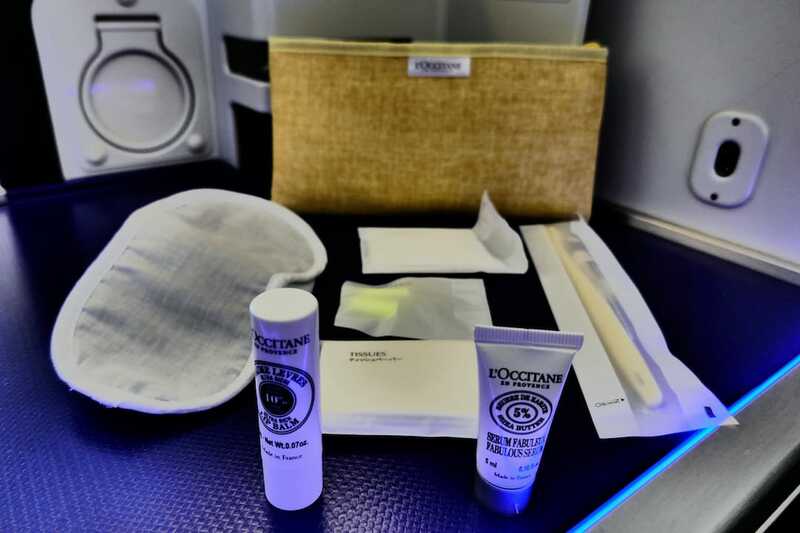 ANA gives all business class travellers a plush flannel toiletries bag filled with L'Occitane products including lip balm to soothe dry lips, a revitalising serum, ear plugs, an eye mask and more. The bathrooms are equipped with Japanese style bidet toilets, and in addition, toothbrushes, mouthwash and wet face towels are provided. We had a fabulous experience from start to finish. The service was outstanding, the food, delicious, and the seats… well, you'll never want to fly economy on long haul flights ever again. ANA has now become one of our favourite airlines and definitely the one we will choose to fly to Japan with again. ANA business class fares from UK to Tokyo start from £2,912 return. 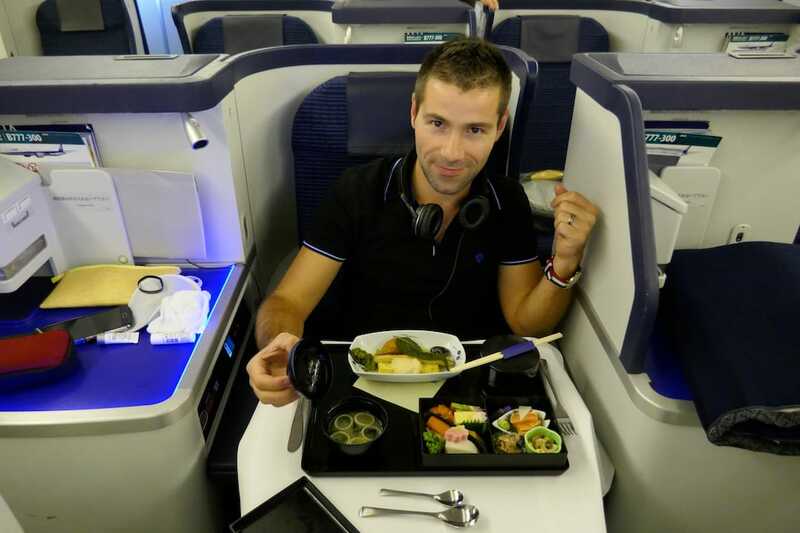 Use Skyscanner to find the best business class deals from London to Tokyo with ANA. To find out more about the gay life in Japan, check out our LGBT gay travel guide to Tokyo and for first timers, read our 10 days itinerary. For more airline reviews, check out this review about flying with Singapore Airlines by our buddy Maria Haase of the EuropeUpClose blog. Hey guys. I loved this service myself when I flew JFK-NRT. My own personal preference is for the onboard sake. Champagne is a, of course, a pleasure, but it’s quite difficult to find the premium sakes on board outside of Japan (at any price). ah now this is how I need to fly, I think that would be the first time I have no pains for a tall person. I am 6″4 (almost 2 m). I lovw getting to fly business class. It is so much more relaxing during travel and makes landing feel so much better. Jet lag is so much better after business class. Ahh loved reading this. Looks like a fab experience. The food looks amazing too. I had the pleasure of being upgraded to business and first class via Philippine airlines and that was pretty sweet too. I’ve only flown business class twice, but I have to say YES I NEVER WANTED TO GO BACK TO BEING IN ECONOMY AGAIN! Hahaha. But of course I had to, because that was just a business trip that I didn’t pay for. Always a diff story when you’re the one to pay. Haha. I’ve yet to fly first class, but I’d be worried I’d never want to go back to economy!! This looks amazing 🙂 I especially love that they give you a glass of champagne when you board and that you ramen is included in the variety of snacks offered–I would definitely order up a bowl of ramen! The seats and amenities look wonderful as well–what a wonderful experience! Well, you two look very comfortable in business class. I’m sure it will not be the last time you travel in such luxury! My favorite part of course, is that wonderful food! My daughter would go mad with all the delicious food offerings, sssshhhhh, don’t tell her about it. Oh to turn left when you get on the plane! I have never flown ANA and now I really want to…but only if I can sit in the big seats with a glass of champagne (or two, or three..) in hand. What a way to travel! I’m considering travel hacking just to start saving up for an experience like this. I’ve flown ANA once before and didn’t find them to be superior to any other airline – but then again, economy is all the same 😛 That food looks to die for. You guys rock. 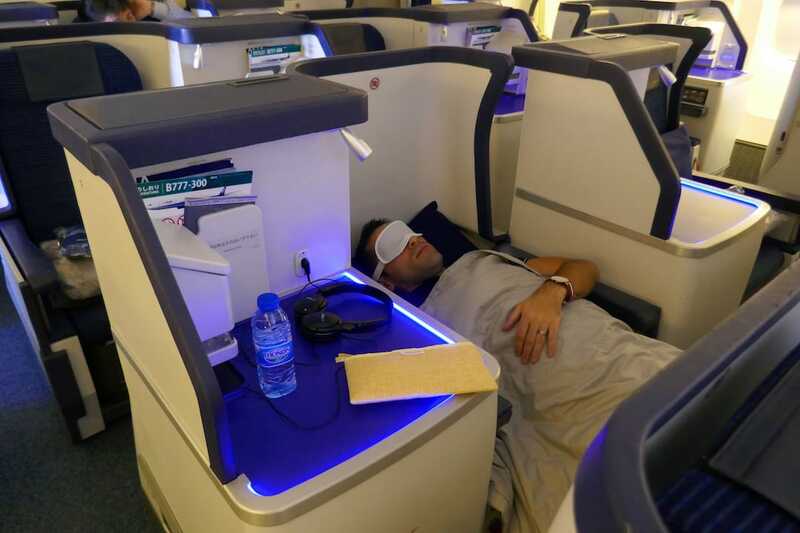 I wasn’t lucky enough yet to try out business class. I would love to. How did it feel afterwards to be in an ecomony class again? Did you guys laughed about it or were shocked? Ha ha ha – thanks 🙂 So true – we have our first economy trip coming up soon and boy that’s gonna be tough! Phwoooar – Auz to Europe’s a long flight eh? Lie flat beds, stellar service and gourmet food? Sign me up! I’ve flown business several times on points or in the good old days when my husband’s status would get us upgraded. It does make it difficult to walk back to economy after a business class experience. Most recently, we flew Air France Business Joburg>Paris. I couldn’t believe the amount of food and drinks they tried to stuff us with on that 10 hour flight! That’s hilarious (and amazing – ha ha ha!) But so so true – how do you go back to economy after flying in business? As travel hackers, we often fly business or first class for free on points. However, after many flights in luxury, I never feel like I belong (could it be my dirty hiking pants? my ragged old backpack??) and I always feel so spoiled…but oh to have steak, a bed and to be pampered on long haul flights! It’s a traveler’s dream! I’ve wanted to fly ANA for a while because of its well-known excellence. 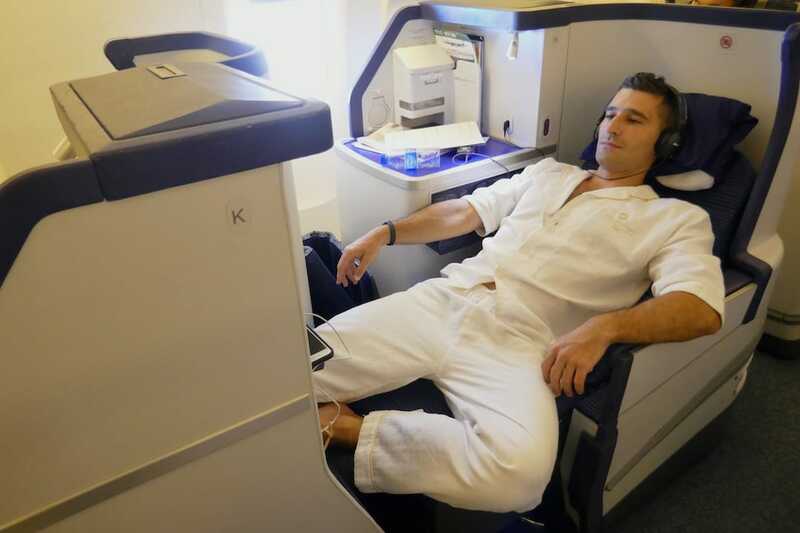 As a miles and points collector, business class flights become for more attainable than paying out of pocket. There is the danger, though, of not wanting to go back to economy! I definitely plan on giving ANA business class a try to surprise my hubby for a special trip! What an amazing surprise that would be! I am so envious. I haven’t long come back from a trip to the US and I flew Virgin Atlantic upper, it was amazing but this looks even better. You had me at ‘amuse bouche’….. Yes, I don;t want to get spoiled like this! I might not be able to go to more places! 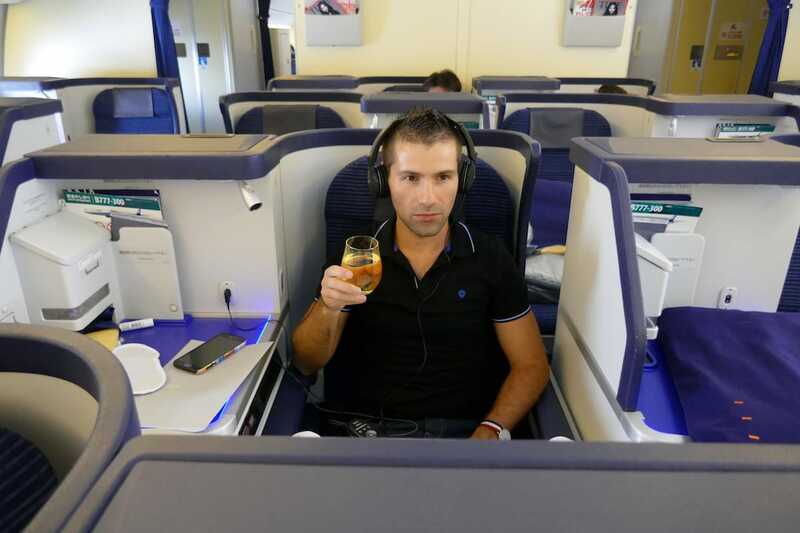 There is one concrete danger in flying business class – it will spoil you from ever wanting to tolerate economy again! I’ve done one trip in business class and now I never want to go back! Oh my god I know right? This is what we kept saying to each other afterwards…. !